Disclaimer: This is not an original recipe. But it’s the best curry I’ve ever made at home, and as such, I want to share it with all of you today. With full credit to the author and cookbook, of course. 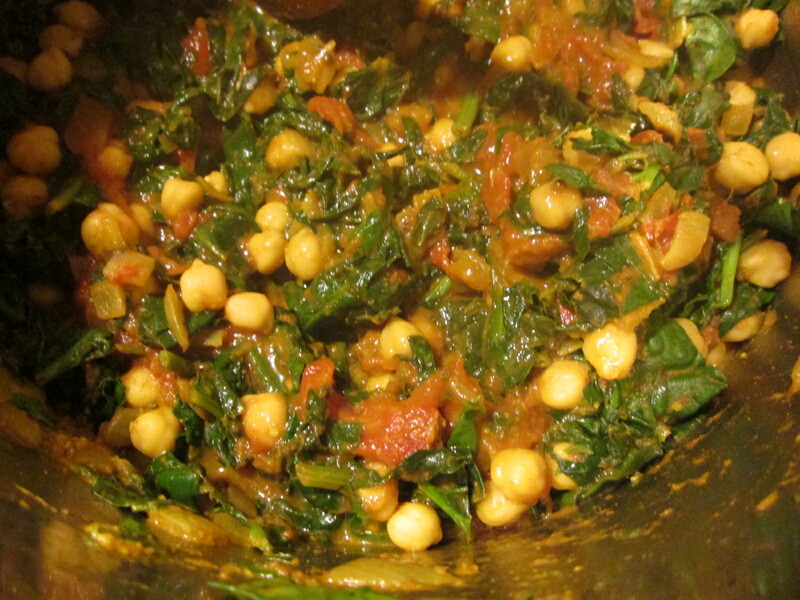 The Chickpea and Spinach Curry comes from one of my all-time favorite cookbooks, Isa Chandra Moskowitz’s Vegan with a Vengeance. This is the first cookbook I purchased after my first intolerance-related diagnosis — lactose intolerance. While I ate a strictly vegan diet for a while, and don’t at the moment, I still love vegan cookbooks. They correlate with my preferred way of eating — heavy on the vegetables — and a good vegan cookbook relies mostly on whole foods, not processed foods. In a completely non-compensated way, I can highly and heartily endorse this whole cookbook (though, honestly, if you’re brand new to vegan cooking, consider starting with Veganomicon, as it’s got more basic information in it and a broader range of recipes). Most vegan cookbook authors are very aware of ingredients and a great place to learn to cook without — no matter what you’re cooking without. And it’s a big hit at potlucks — with vegans and omnivores alike. The recipe below is kind of huge. If it’s just for me, I made a half-recipe. Cover the pot and let the seeds pop for about a minute. They do pop, like popcorn. It’s cool. Sautee until it starts to brown — 5-10 minutes, depending on your heat level. 10 cups of spinach, chopped. Yes this seems like a TON, but it really will all incorporate perfectly. 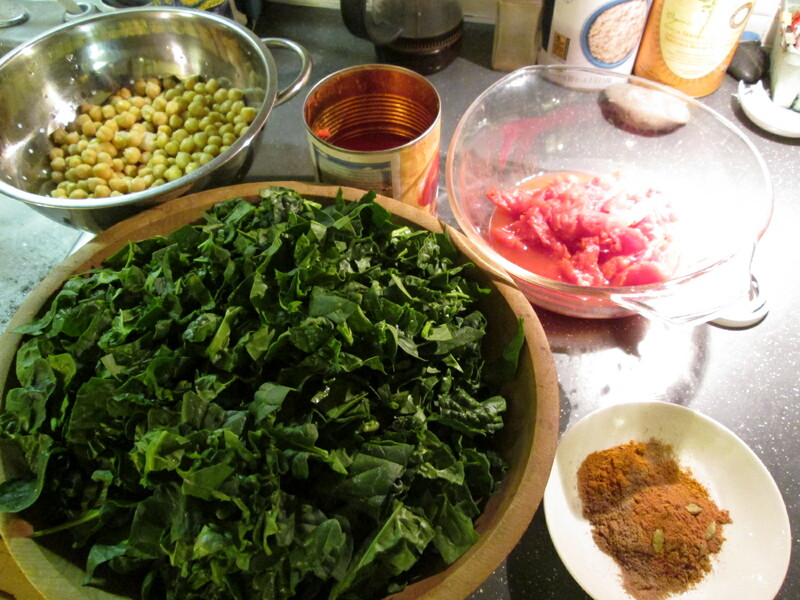 Add this in handsful, stirring each addition until wilted. Stir, cover and turn heat to low. If you’re planning to make rice, start it now. Let the stew simmer for 10 minutes. Uncover, stir, taste. Adjust the seasonings if necessary (I’ve only ever needed a tiny pinch of salt), and let simmer for another 10 minutes, until its all thickened and wonderous. Enjoy it over rice. *The single asterisk represents minor alterations I’ve made to the original recipe. 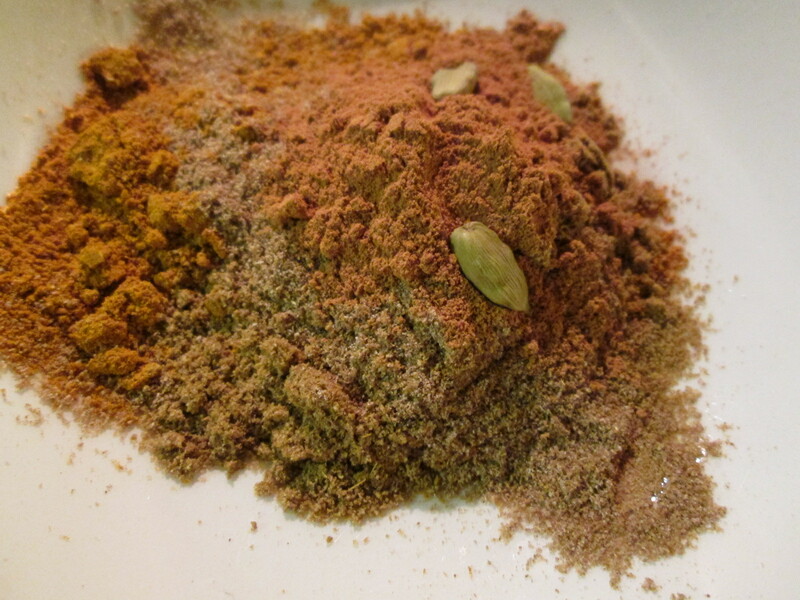 **Curry powder is amazing, but it’s a blend of ground spice, so quality can vary widely. To get a good curry, the spices must be fresh when they’re combined and reasonably fresh when you use it. And your curry dish will only be as good as your curry spice is. As you might already know, both of us believe the post-apocalypse relies heavily on Penzey’s Spices, based in Wisconsin. They have a variety of curries; if you’re new to curry, try the sweet curry. Curry is NOT inherently spicy hot, so don’t be scared if you don’t like spicy. If you do like spicy, try the hot curry. So that’s the best curry I know how to make. Let us know what you think. Previous Post:2013-04-12 Fabulous Friday Sunshine Awards! It is! I totally wish I could claim credit for its invention.